Earlier I wrote about how to avoid spam filters, however, there is another kind of similar challenge for email marketers, which is the spam traps. Spam traps could be deadly for an email marketer and could lead to serious deliverability issues. 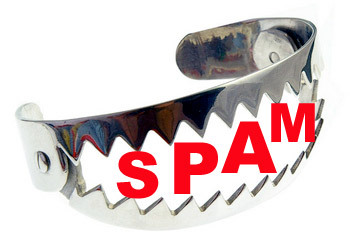 Let’s take a detailed look at what are spam traps, how they can affect your email marketing campaigns and what you can do to avoid such spam traps. What is Spam Trap ? Spam Traps are basically honeypots to attract spams. These are email addresses that are made available across the web in various places but these addresses do not belong to any one and are never used by anyone to send emails. So when an email comes to any of these addresses that is a sure shot indicator of the fact that the sender has built his list by harvesting email addresses off the web and can be clearly labeled as spam. While this sounds pretty reasonable, there could be reasons for such spam trap emails to land up in your email-marketing list and consequently landing you in several blacklists. Spammers would often use suspected spam trap email addresses to sign up on several legitimate email list. As this happens more often this type of exercise basically reduces the reliability of the spam trap and hurts the credibility of any blacklist arising out of it. Also, there are some email providers who use expired email addresses as spam traps. For example I might subscribe to your list today and then change my email address after a month and if my email provider decides to use my old email address as a spam trap, your mails will keep falling into it. How to avoid Spam Traps ? Database Source : Never use a harvested database from the web or buy ready made lists. These lists have the highest chance of having spam trap emails included in them. Double Opt In – A sure fire way to ensure that you are having genuinely interested people in your list. After your users subscribe to your list , send them an email with a link, that they need to click and confirm their subscription. Keep The Bots Away – Most spam attacks are typically done by bots. Add in a captcha to your subscription form to ensure that people filling in your subscription forms are real human. Users are often do get a little irritated by captchas and other similar verification methods but this also shows their commitment. Periodic Cleaning – In spite of the above two, you will notice that with time the bounce rates increase on your list. It is important that you do periodic cleaning of your email list to keep it up to date. In my previous article I mentioned about How Streamsend allows you to avoid the spam box but I was pleasantly surprised to have found in their knowledge base that they if they find known spam trap email addresses in your database they would not allow you to send the mailer. While it is not possible to track down all spam traps, this is a great step that they are taking to not just protect their reputation but also to help the email marketers get more out of their campaigns.